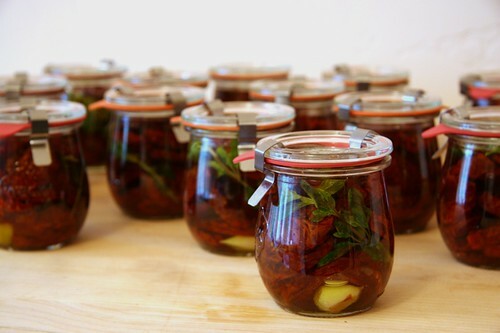 Since I'd never actually done anything like this before, I decided to read up on canning and preserving a bit, just to see how many ways I could possibly kill myself and my friends with some well-meaning confit. What I read scared me a bit, which was by the way not difficult to do for a germ-phobic like me. Botulism and whatnot, you know. So I reexamined the procedure I learnt in Greece, knowing full well that Europeans have a rather admirably nonchalant way with food, and that seemingly through sheer will power, they don’t seem to get sick from food much either. Having spent so many years in America, and actually having enough assets to be scared of a wrongful death lawsuits from my friends' next of kin, I decided to reexamine the process. 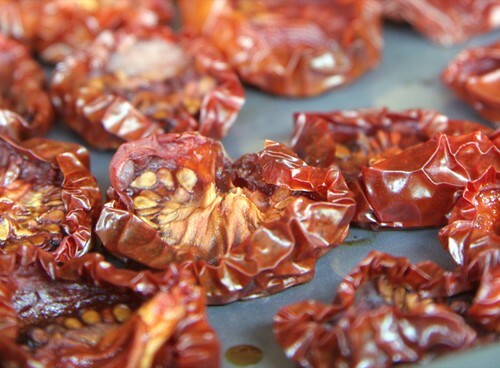 I didn't think that the sun here was hot enough to dry tomatoes, so I dried them on cookie sheets in my oven, set at the lowest temperature –which was 170F on mine- for about overnight and then a bit more until completely dry. I needed about six cookie sheets for all the tomato halves. And, of course, six cookie sheets did not fit in my oven, so two of them went across the street last night to my friend Eric's house for a sleepover. The vinegar bath made a lot of sense, since the Botulinum bacteria grow well in anaerobic, that is to say oxygen free, and low acid environment. 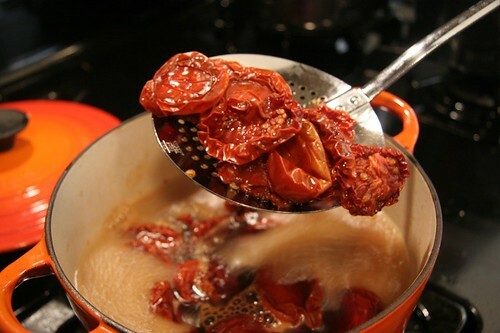 Giving the tomato pieces a bath in boiling vinegar not only sterilizes the dried tomatoes to kill surface bacteria, but also raises the acidity level of sweet tomatoes to lessen the chance of Botulinum growing in the jar later. I was a little squeamish about adding whole raw garlic, so I gave them a quick bath in the same hot vinegar. I also decided to heat the oil before adding to the jars, to sterilize the oil and the herbs and everything else in the jar. The clove of garlic went into the bottom of a jar -sterilized, of course, in boiling water or just run them through a cycle in the dishwasher- then the tomato pieces were placed in neat layers until the jar was full. A sprig of Marjoram went into the side, and the whole thing sealed with a glass top and gasket, fastened with two metal clips. The jars were then put in two large (8 q.) 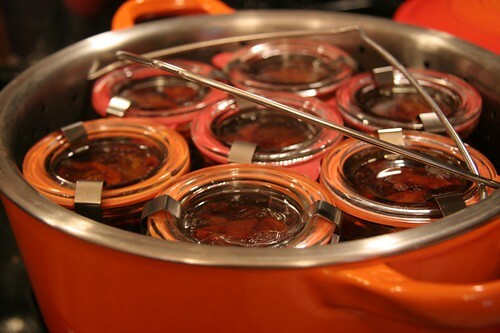 Le Creuset pans and filled with water up to about one third of the way up submerge the jars completely. The water was heated to a full boil. The jars were sterilized in the boiling water for thirty minutes. As the jar cooled down, the gasket –a new word I just learnt for that thing I used to call the rubber ring thingy- is sucked in to create a vacuum, and the metal clips can be discarded. As usual, I don’t have an exact recipe, but the process is really easy as you can see from this post. I can tell you, however, that for my 20 pounds of dry-farmed tomatoes, I needed about three cups of vinegar (red or white wine vinegar will do), 7-8 cups of good olive oil, and everything got packed into 18 six-ounce jars. 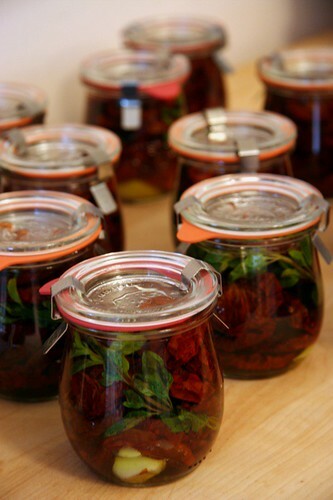 Also, do remember to let the jars cool down completely before removing the metal clips or you might lose the vacuum seal –not that I just made that mistake or anything. 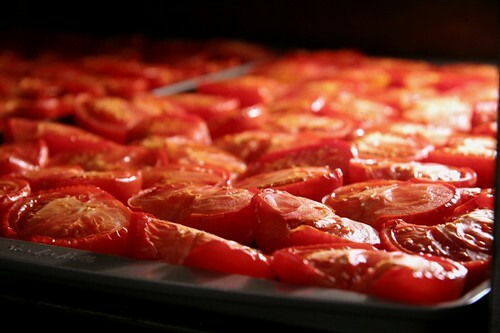 This tomato confit is so versatile, and so easy to do. It's delicious eaten right from the jar, layered with goat cheese to make a gorgeous terrine to serve with bread, or cut up and tossed with some pasta for a quick meal. 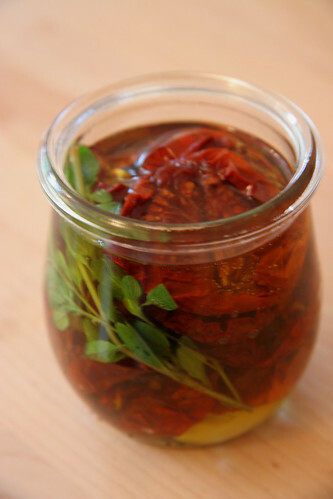 The olive oil in the jar is great as well, having taken on the flavors of sweet and tart tomatoes, garlic, and Marjoram. This is such a great thing to have around I might just do another batch next week!